"Pawsitively" Dedicated to Helping Prairie Vista Thrive! Next Week (May 2-6) is Staff Appreciation Week for our AWESOME Staff at Prairie Vista. Our committee has a great week of Dr. Seuss themed daily events planned for our staff. 1) Please go to our Prairie Vista School Facebook page or Prairie Vista PTO Facebook page to get the link for “Signup Genius” which is the website we use for all the ways you can help with food and supplies for the week. You can also text call or text any of us on the committee and we can text you the link. 2) At the end of the week we want to offer each staff member (60 people altogether) a small gift. We are asking for $5 gift card donations from any store you think the staff would enjoy. We will accept them all week. Deadline is Friday morning (May 6th). 3) On Friday, May 6th have your student wear RED and/or BLACK for CAT in the HAT Day to show our PUMA love for our STAFF. 4) Please see the attached flier for a letter your student can fill out for his/her teacher that can be sent in anytime during the week. Thank you so much for your help in making our Prairie Vista STAFF APPRECIATION WEEK a HUGE SUCCESS for our 60 staff MEMBERS. Schmucker Middle School and Prairie Vista Elementary PTO’s will be hosting a joint Parents Internet/Cyber Safety Information Night to be held in the Schmucker Middle School Cafe on Tuesday, April 26th at 6:00pm. Eric Tamashasky will be sharing an incredibly informative presentation on watch-outs and pitfalls for parents as our children become more internet savvy and are introduced to social media. Eric has spoken at Penn High School as well as many other area schools. The hour-long presentation will address topics such as personal privacy, scams/frauds, law enforcement investigative techniques and protections, peer-to-peer problems, social media traps, catfishing schemes, cyberbullying, and sexting/sextortion (at a grade-appropriate level). Eric Tamashasky is the head of the St. Joseph County Police Cybercrimes against Children Unit, a volunteer deputy prosecutor, an adjunct professor at Notre Dame and Trine University, and has received training from the United States Secret Service (mobile device forensics and online social networking), National Center for Missing and Exploited Children, National White Collar Crime Center, and the Internet Crimes Against Children (ICAC) Task Force. He has two kids (Charlie, 3rd Grade; Alex, Kindergarten) at Saint Joseph Grade School. He also presents to incoming freshmen and their parents for St. Joseph High School each fall. Thank you to Dana Durfee and her mom for making this beautiful quilt. 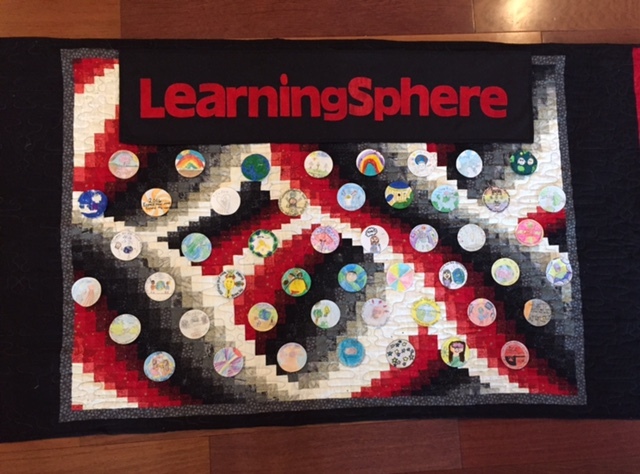 The quilt displays all of the LearningSphere art submissions with the LearningSphere logos. Reminder, LearningSphere is this coming Wednesday, February 10th. Stop in and see all of the amazing projects from 7:00am-7:30am or from 2:30pm-5:30pm. Banish the winter blues away and help the Prairie Vista community celebrate Winterfest on February 4, 2016 from 5:30-8:00 PM. This fantastic celebration is one for the entire family – filled with fun games, lively entertainment, and delicious food! Learn more here. Click on the Winterfest Logo to enter the Winterfest Website. The Prairie Vista PTO is committed to advancing and reimagining the educational and ecological gem that our school has in its prairie. 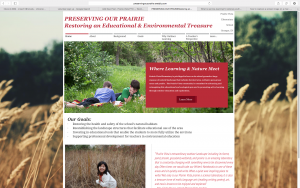 Learn more about our vision for the prairie at Preserving Our Prairie. Don’t miss PV’s annual Fun Fair on September 11 from 5-8 PM. 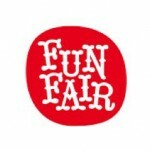 Want to volunteer to put the FUN in Fun Fair? Click HERE! The P.V. Student Directory form is now closed. If you have any questions, please contact Edwine Jean-Pierre at ecjp357@gmail.com. 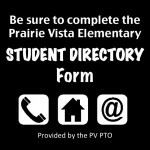 The information you provide in this form will be used to make the Prairie Vista student directory and for PTO purposes only. This online form is intended to replace much of the PTO paper documents sent home in the “back-to-school” packets. Our hope is to streamline the back-to-school process for families, increase accuracy in the directory and reduce overall paper usage. 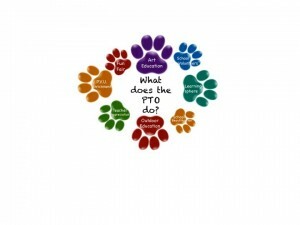 The educational experience of students at Prairie Vista is greatly enhanced by the work of the Prairie Vista Parent Teacher Organization. The PTO helps our Prairie Vista learning community thrive by supporting the education of our students, sponsoring events that strengthen the school community, and offering programs to enrich our children. Coordinating an incredible team of volunteers to help our kids learn and grow! This year the PTO teamed up with Prairie Vista to help install 21st century learning technology in every classroom at school. Our goal was to ensure that interactive technology will be at the fingertips of all of our teachers and learners by the start of 2014-2015 school year. We are thrilled to announce that with the help of grants, support from PHM, and a large gift from the PTO, Prairie Vista has reached its goal and will be installing Mimeo Teach Bars and short throw projectors in every classroom! The PTO would like to thank everyone who contributed to this effort. A special thanks goes out to the teams of parents who made our fundraising events so succesful. Take a look at this video to get a sense for why we are so excited. Projector Thanks from Clare Roach on Vimeo.